January 19 commemorates the birth of newspapers in India, and WAN-Ifra's South Asia assistant business development manager Suresh Babu says it would be a "fine gesture" to publish one of the ads. Three scalable versions have been prepared in both mono and colour, and the promotion comes with the encouragement of South Asia committee members. You can download them here. 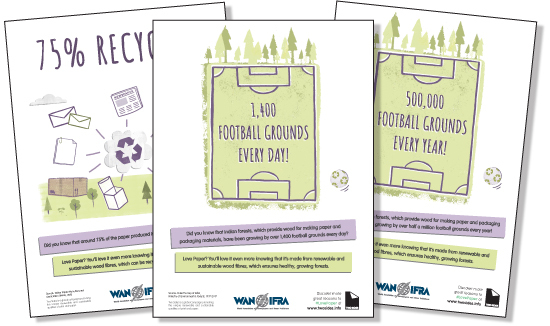 Last August, the World Printers Forum published a report on in partnership with Two Sides, which promotes the sustainability of the graphic communications supply chain. The report looked at the sustainability attributes of key raw material for printed newspaper and compared it with that of the sustainability of online delivery of news and that of other related industry. The effort was to counter misconception about the sustainability of printed newspapers and magazines and the belief that buying newspapers and magazines leads to deforestation. For more information about the Love Paper campaign, or to request additional adverts, please write to lovepaper@twosides.info or infoindia@wan-ifra.org with other queries. The birth of the first newspaper in India is dated to January 29, 1780, with the first publication of a weekly called Hickey's Bengal Gazette, also known as Calcutta General Advertiser.